Pope Francis has urged Roman Catholics not to ignore the plight of millions of migrants "driven from their land", during Christmas Eve Mass. The pontiff compared them to Mary and Joseph, recounting the Biblical story of how they travelled from Nazareth to Bethlehem but found no place to stay. He has made defence of migrants around the world a major theme of his papacy. The Pope is set to give his traditional "Urbi et Orbi" ("to the city and to the world") Christmas address on Monday. 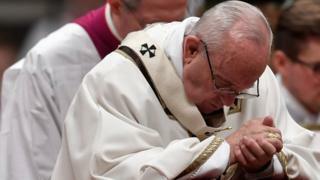 "So many other footsteps are hidden in the footsteps of Joseph and Mary," he told worshippers who gathered in St Peter's Basilica on 24 December. "We see the tracks of millions of persons who do not choose to go away but, driven from their land, leave behind their dear ones." Pope Francis, the leader of roughly 1.2 billion Roman Catholics, is himself the grandson of Italian migrants. He said many of today's refugees were fleeing from leaders who "see no problem in shedding innocent blood". There are more than 22 million refugees worldwide. The latest cross-border influx involves the Rohingya fleeing violence in Myanmar. The Pope visited Myanmar last month and later met members of the Muslim minority who had sought refuge in neighbouring Bangladesh. The Pope stressed that faith demanded that foreigners be welcomed everywhere. Christians celebrated Christmas morning Mass at the Church of the Nativity in Bethlehem, built on the site where tradition says Mary gave birth to Jesus. There were fewer pilgrims than usual in the West Bank town this year. The town has seen clashes in recent weeks between Palestinian protesters and the Israeli army, after President Donald Trump's contentious decision to recognise Jerusalem as Israel's capital.